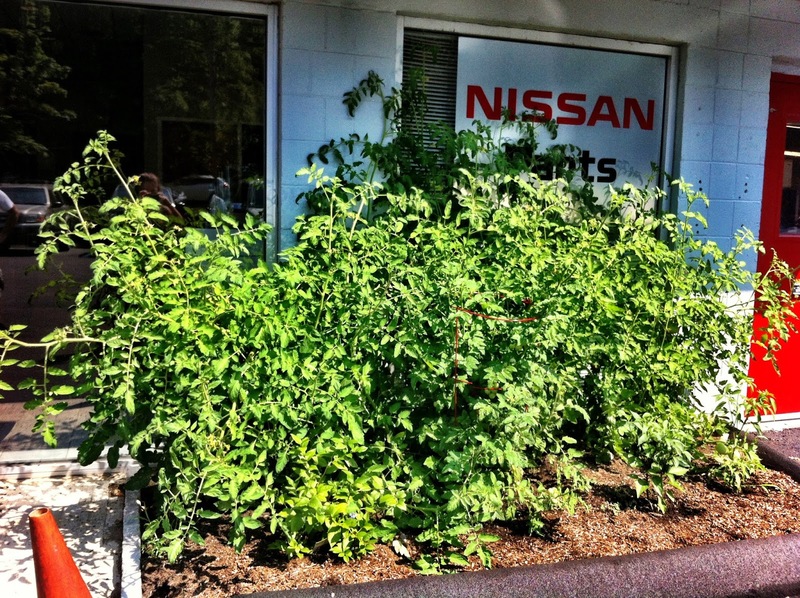 While at a TV commercial shoot for our business client Bruce Bennett Nissan I discovered one of my favorite things - an unexpected edible garden. 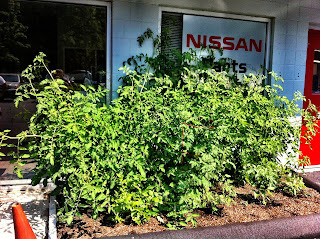 Yes, while Renato was running around actually doing work, I was completely distracted by a delightful garden created in a small patch of ground around the side entrance of the service center/parts department. Yes, surrounded by asphalt, orange cones and passing people sits a tiny blueberry bush, tomatoes, hot peppers and probably a few more things I didn't see. I wonder if customers even realize it's there. 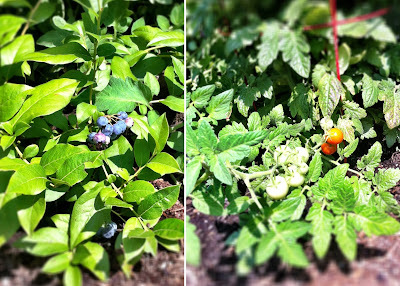 As you may or may not know, I seriously love discovering these kinds of unexpected edible gardens. It proves that you can grow something anywhere. To be honest I think a few of their plants are looking better than mine at the house. Seriously, how cool is that? It's amazing what can be done in a small space. Have you run across any unexpected gardens in your neck of the woods? Do you grow edibles in a surprising space? I LOVE hearing about food growing in unexpected places. A little soil, sun and water and anything can happen! I was recently in Bend, OR, where I was shown a dynamite urban garden on an urban block, behind a food truck and a bakery. Perfectly convenient for those businesses, who take advantage of whatever is growing and integrate it into their daily specials. Yes exactly. That garden in Bend, OR sounds so great. I'm always on the lookout for that kind of thing. That is awesome. I went to a new local restaurant and a local farm donated grape tomato plants for there outside patio. It was great. They use the harvest for their salads.